Spring Break has arrived and while many hit the beach for fun under the sun, there will be a ton of action under the lights. 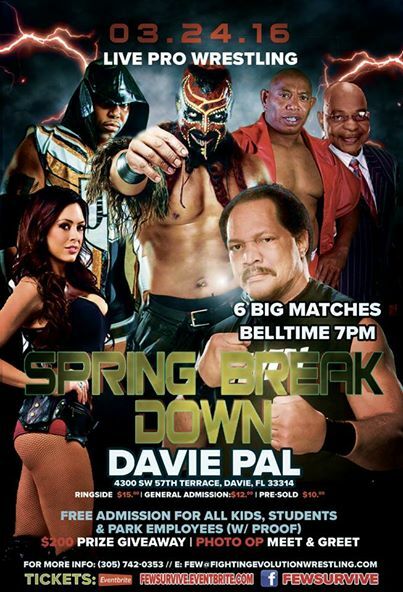 FEW presents Spring Breakdown at the Davie PAL, 4300 SE 57 Terrace,March 24 with JB Cool, former WWE wrestler Two Cold Scorpio, Boogey Man, Teddy Long and WWE hall of famer Ron Simmons. The long time south Florida wrestler joined The Roman Show to talk about the big show. “We decided to bring some of my friend’s I’ve bet along my career,” he said. JB will be squaring off with long time favorite 2 Cold Scorpio, which is a dream for him. “The birth of JB Cool was actually after witnessing and learning the business and watching Flash Funk (Two Cold Scorpio),” he said. “He is my idol. Bringing him down to the show and getting an opportunity to bring him down is an honor. JB also opened up about his wrestling facility in South Florida. JB said he is dedicated in spreading the knowledge of the business. To hear the complete interview, click above.